Buy Doves Farm gluten free baking powder 130g in the UK from our online shop or directly from our independent Scottish store. A classic raising agent for adding to plain flours when making cakes, scones and puddings. Our Baking Powder is a classic raising agent for adding to plain flours when making cakes, scones and puddings. Each tube contains 130g of Baking Powder, enough to make 26 Cinnamon cakes or a variety of other cakes. mono calcium phosphate, sodium bicarbonate, corn starch*. Who knew you can have your 'greens' and have cake at the same time?! This moist cake is a great way to avoid dairy and eggs or to surprise friends and family with. This recipe contains 1tsp baking powder. Rolled pancakes filled with creamy and 'sheesy' leeks. Great as finger food or as a main meal. This recipe contains •A pinch of Baking Powder. These savoury muffins are the perfect entrée to any vegan meal and a real Sheesy treat and just another example of healthy, guilt free nibbles made possible with our dairy free Sheese range. This recipe contains 1 teaspoon baking powder. A delicious cake to celebrate the taste of autumn. Of course, this recipe would in season year round, honey doesn't really go off. Brimming with Scottish ingredients like local, Scottish honey, Scottish flour and Scottish organic eggs. This recipe contains 1 tsp Baking powder. Who doesn't want chocolate on cold, January days? What's even better is that these cupcakes are dairy free and gluten free and made with low GI ingredients! This recipe contains 1 tsp gluten free baking powder. Muffins with seasonal fruit and Yogi Rose tea, what a wonderful combination! This recipe contains 12g baking powder. It takes a few days to get a sourdough starter going but once it’s active you can mix up your vegan pancake batter in the evening, let the magic happen overnight and cook these chunky pancakes for breakfast. This recipe contains 2 tsp FREEE Baking Powder. As official Doves Farm stockist, we sell genuine Baking Sundries directly from our shop in Scotland and online throughout the UK. Doves Farm are organic flour specialists and a family owned enterprise, drawing the majority of these and many raw materials from the local Wessex area. They are dedicated to upholding organic, ethical and Fairtrade agricultural systems, nurturing partnerships with suppliers and customers and supporting local community projects. View more products from Doves Farm. Where can you buy real Baking Powder - gluten free safely online? If you are wondering where you can buy Doves Farm gluten free baking powder 130g safely online in the UK, then shop with us. We are an actual health foods shop; with real people selling real foods and products. Our award-winning independent shop is located in Stirling, Scotland since 1976. You can buy our Organic flour and other genuine Baking Sundries in store or safely place an order with us online or over the phone. 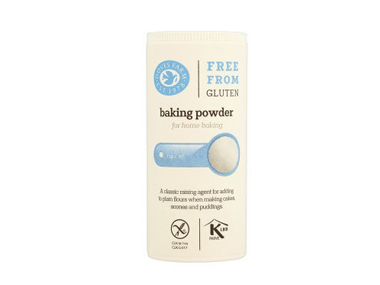 Baking Powder - gluten free - Doves Farm gluten free baking powder 130g in Baking Sundries and Baking.